2U, an education tech company that partners with academic institutions to deliver degree programs and credit-bearing courses online, today unveiled plans to acquire Cape Town and London based education company GetSmarter for approximately $103 million. According to the announcement, the deal accelerates two of 2U’s strategic growth initiatives: expanding internationally and offering non-degree alternatives. Founded in 2008, GetSmarter partners with college and universities to deliver short continuing education courses that allow working professionals to update their skills. 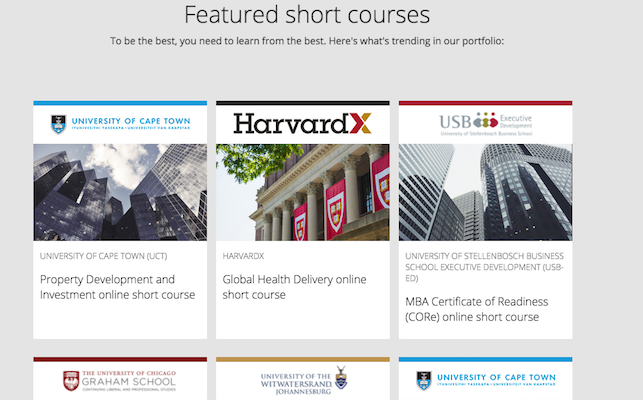 Its portfolio includes more than 70 courses with partners like Harvard, MIT and the University of Cape Town. For example, a 10-week online course (90 hours) with Harvard’s online learning initiative HarvardX called Global Health and Delivery teaches individuals how to design and reimagine global health interventions. GetSmarter’s platform is designed to keep online learners engaged with videos, quizzes and more in each module. One of its most popular features is a virtual course learning coach, which supports students and monitors progress throughout the whole course. Additionally, collaboration features enable learners to communicate with others in the course, asking them questions and receiving feedback. Last year, GetSmarter earned $17 million, “primarily generated by students enrolled in the company’s existing programs with its legacy South African universities and one university in the United States,” the announcement said. Its user base includes more than 50,000 learners worldwide and the company has a goal to reach 1 million by 2030. 2U is expected to close the acquisition during the third quarter of 2017 (subject to change). To offer more details about the acquisition, 2U will host an audio webcast and conference call May 4 at 5 p.m. ET. Interested individuals in the United States can participate by dialing 1 (877) 359-9508. Individual outside of the U.S. can dial 1 (224) 357-2393. A recording will be made available on the 2U site following the event.